The 90 series allows units to be connected together without the use of pipe connectors. This saves space, provides constant mounting centers, and maintains a modern aesthetically pleasing appearance. Click any of the 90 Series FRLproducts below for more detailed information! New! The 90 series filters are specially designed to efficiently filter out rust, dirt, moisture and other impurities from compressed air lines. Operation is fully automatic with a minimum of pressure drop. The 90 series regulators are designed to provide quick response and accurate pressure regulation for the most demanding hi-flow industrial applications. The rolling diaphragm was designed for long trouble-free operation and will not rupture or tear under high cycle or demanding applications. 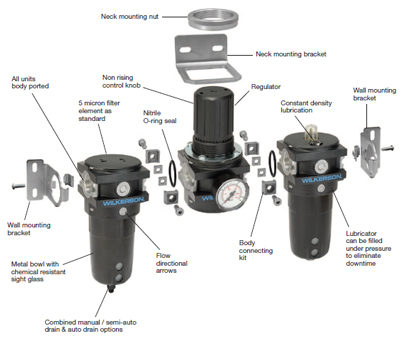 The 90 series mist lubricators are designed to provide lubrication for many general purpose applications.